NemID – self-service on the Internet - Agriculture Internships in Denmark.Agriculture Internships in Denmark. Denmark have a so called digital signature, NemID. 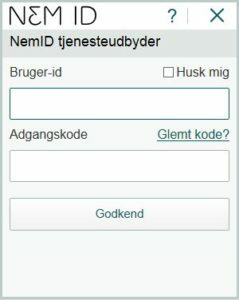 NemID – ‘Easy ID’ is the Danish digital login solution for both public self-service, online banking and access to the digital portals for your paychecks, SKAT etc. NemID is a common secure login on the Internet, whether you are doing your online banking, finding out information from the public authorities or engaging with one of the many businesses that use NemID. With NemID you can do most from home if you have a computer and connection to the Internet. NemID makes it safe to send confidential and personal information on the Internet. You can send encrypted email and use public and private online services. At NemID. nu you can read more about what NemID is and what it can be used for. How do I obtain NemID? Order NemID online (requires Danish passport or Danish Driver’s licence).